Rain, Rain Go Away — Or Don’t. I’ve generally had good luck playing golf in Scotland when it comes to weather. Oh, there was the time that it hailed on us at Carnoustie. And the sideways, blasting rain that Dove Jones, David Fleming and I got stuck in at Prestwick did finally make us turn around and head in. But by and large, I’ve been lucky. More sunny days than foul ones. But even a sunny day in Scotland can turn on you in a hurry. Their weather is schizophrenic in that way. So it pays to be prepared. This trip, I’ve armed myself with a Sun Mountain H2NO stand bag – the only bag I know of that’s been engineered especially to be waterproof. Not water-resistant. Waterproof. Sun Mountain has a lot of experience with waterproofing clothing (more on that in my review of their Torrent rain gear) and it pays off here. When the rain hood is in place, what’s inside stays dry. The fabrics they use are waterproofed, the seams are sealed and waterproof – even the zippers are designed to keep water out. Today, on our first day of the Golf Road Warriors Scotland trip, we played at Dunaverty Golf Club in weather that would make most golfers cry for their mommies. And what was inside this bag stayed dry – including my watch, cell phone, wallet and even a scorecard. Above and beyond its waterproofing, it’s a nice stand bag. 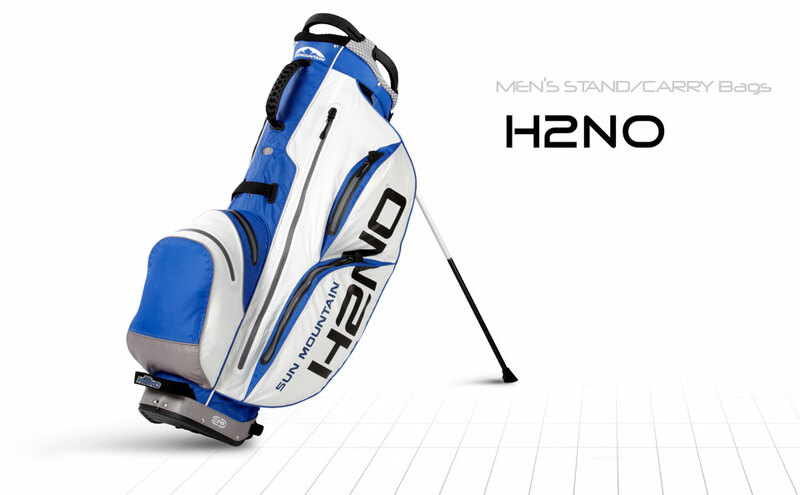 It’s got four compartments up top so it’s easy to keep your clubs organized. It’s sturdily built, with an easily manageable two-strap carry system, three handles at the top so it’s easy to move around, nine pockets (waterproof) for keeping your accessories and valuables, and of course a matching rain hood. For what it’s worth, it also has a riding cart-friendly bottom and leg lock system, but that’s not a feature that I’ll be using – and particularly not in Scotland where everyone walks as golfers should. For more on our Scotland Golf Road Warriors adventures, go to: Scotland Golf Road Warriors.